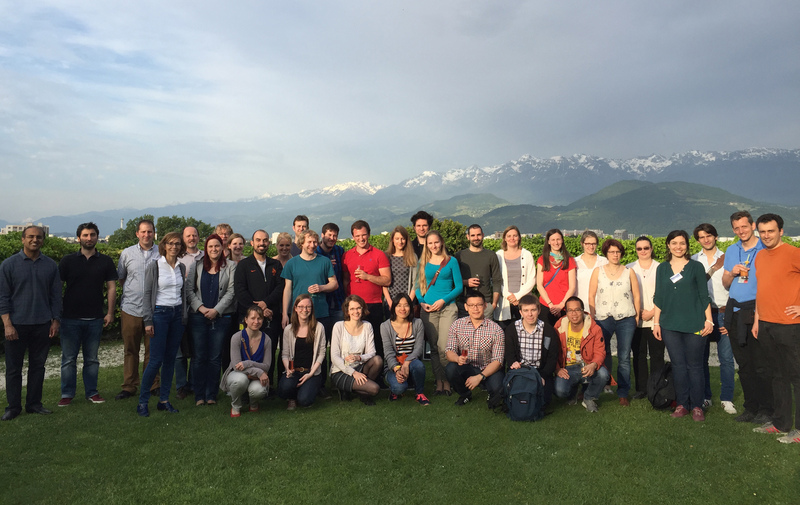 This past May the Instruct France-2 centre in Grenoble welcomed twenty young scientists to spend a week learning how to address challenging problems in structural biology. The group attended the EMBO Practical Course on the Structural Characterisation of Macromolecular Complexes, an Instruct-sponsored event co-organized by the European Synchrotron Radiation Facility, the European Molecular Biology Laboratory, the Institut Laue-Langevin and the Institut de Biologie Structurale. The thirteen PhD students and seven postdocs attending the course came from across Europe, Asia, the U.S. and South America. Course lectures were given by twenty-five speakers, and covered topics such as: multi-subunit expression in bacteria, insect and mammalian cells; affinity, electrophoretic and centrifugation methods to isolate and purify complexes; biochemical and biophysical experiments that inform on stoichiometric and conformational homogeneity; and strategies for determining the 3D architecture of large macromolecular assemblies and their structure at atomic or pseudo-atomic resolution. Practical sessions on several Instruct platforms allowed students to gain hands-on experience with techniques presented during the talks. Activities included collecting diffraction and SAXS data at the ESRF beamlines, preparing sample grids for electron microscopy, crystallising a large RNA molecule, and analysing protein-protein interactions by NMR and isothermal calorimetry. The full course description can be found here. The next edition of this course is currently planned for the spring of 2018.